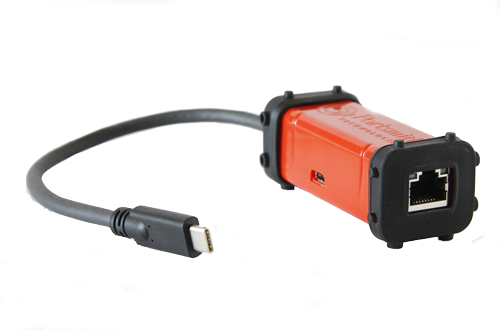 Portsmith’s USB to Ethernet Adapter can quickly and easily add Gigabit Speed networking access to almost any Mobile Computer equipped with a USB C port. The PSPA1C1GE is compact, durable and efficient. Designed with high quality materials and very precise tolerances, it is designed to perform. Unlike other adapters, it will withstand a lifetime of being dropped, moved and generally tossed around your work environment. 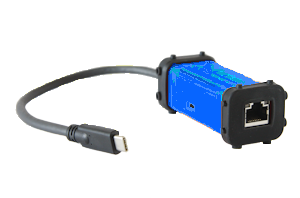 Designed to minimize failure points, the PSPA1C1GE requires no separate power supply, has grounded wiring from both the USB and Ethernet ports, and operates on very low power draw directly from the USB connection. ALTERNATIVELY by supplying power from an external USB C power supply, the adapter can charge the connected USB host device. PSPA1U1GE is designed using high quality components enabling reliable connection in most environments. The molded end caps enable the adapters to withstand multiple drops to concrete.